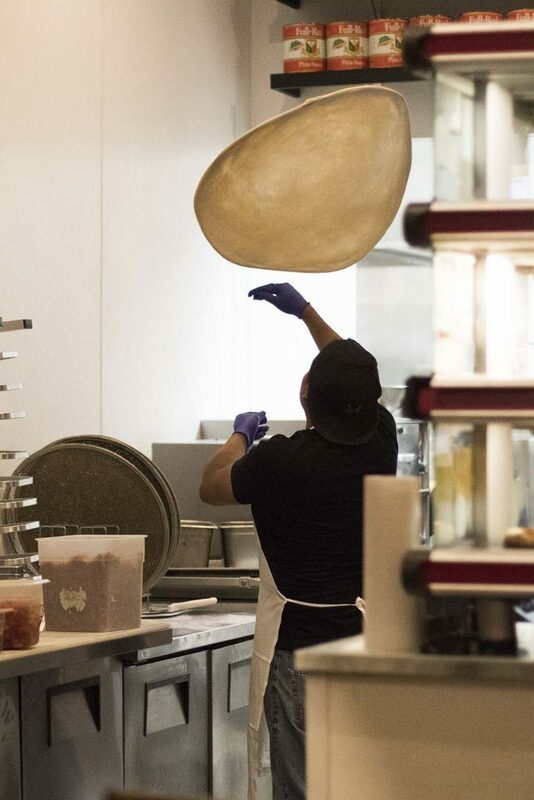 It’s 10 o’clock at night, and you’re jonesing for a burger … or pizza … or tacos. The problem is that many restaurants in Oklahoma, barring run-of-the-mill, fast-food joints, shut their doors early. But some places welcome night owls with open arms and open doors. 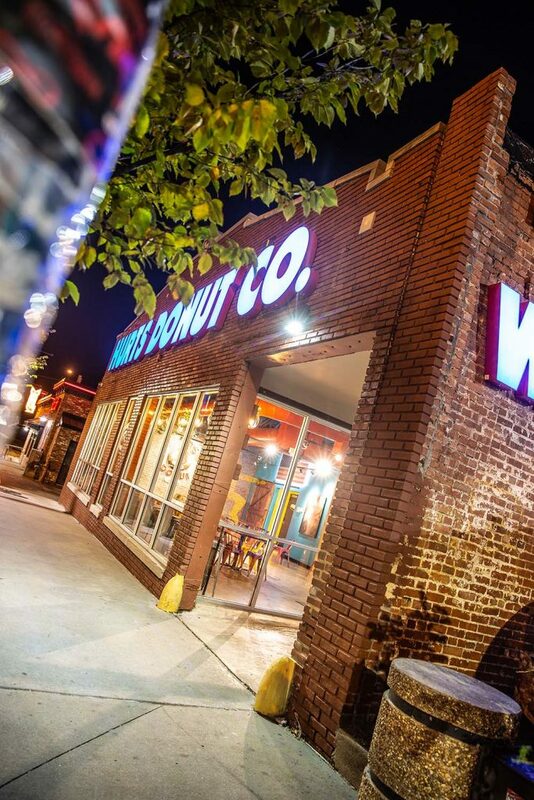 These purveyors of late-night dining understand the meaning of a midnight snack. 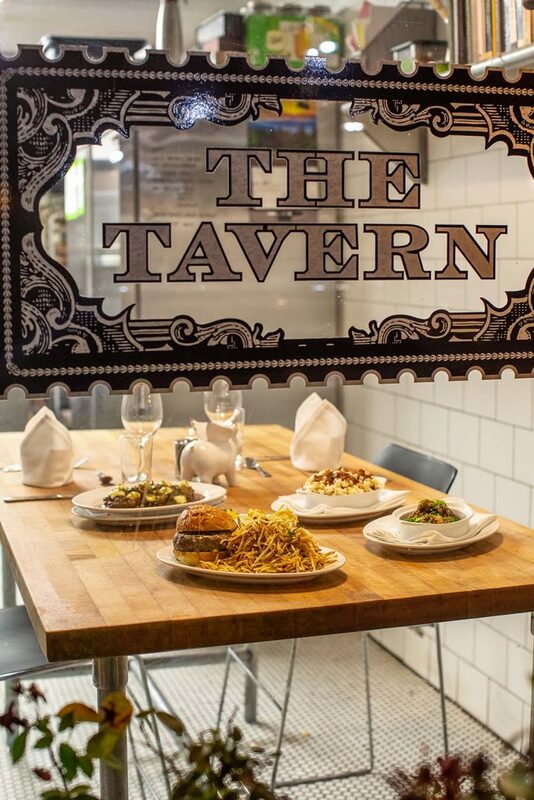 Dimly lit, elegant but not too stuffy, The Tavern toes the line between fine dining and a casual night out. 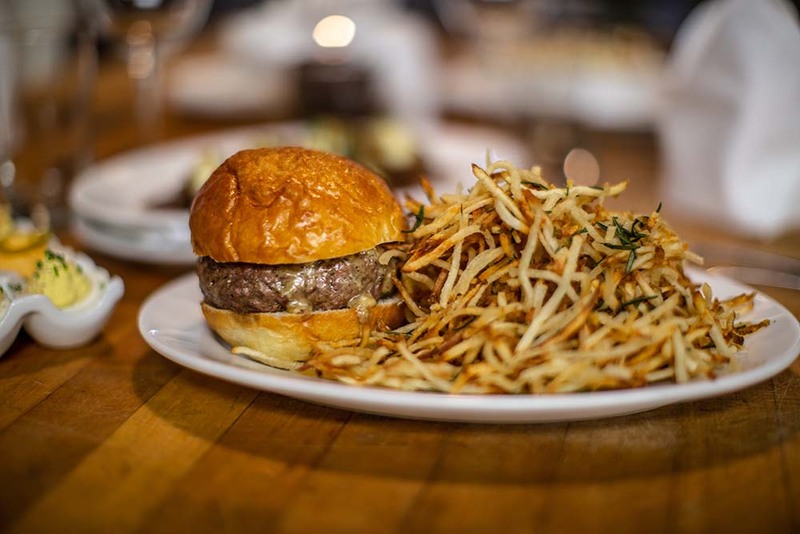 You get excellent service and ambiance, plus one of Tulsa’s most delectable hamburgers (The Tavern Burger, half price every night after 9). 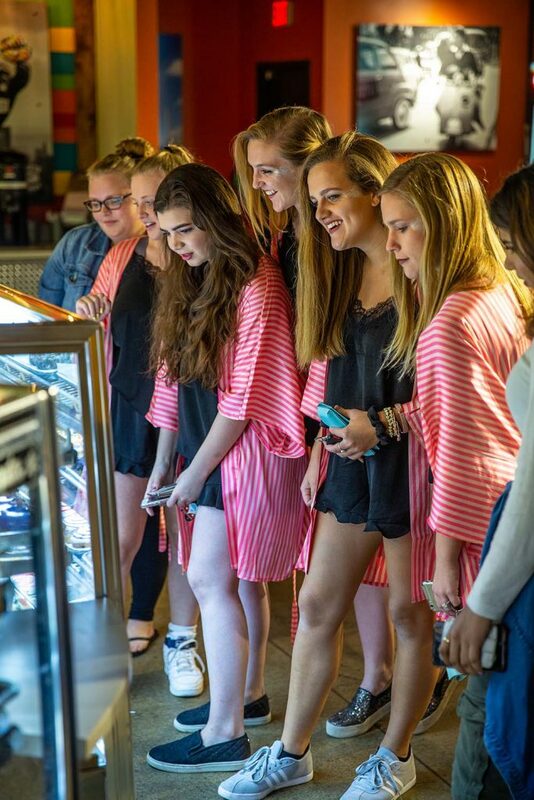 Hoards often stroll in after Cain’s concerts – and they’re welcomed with a smile. 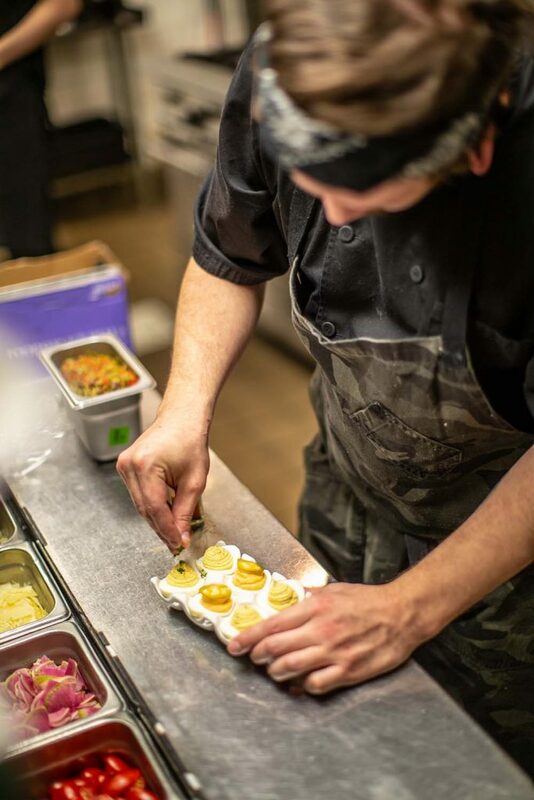 Try the famous deviled eggs as your starter. You’ll thank us later. 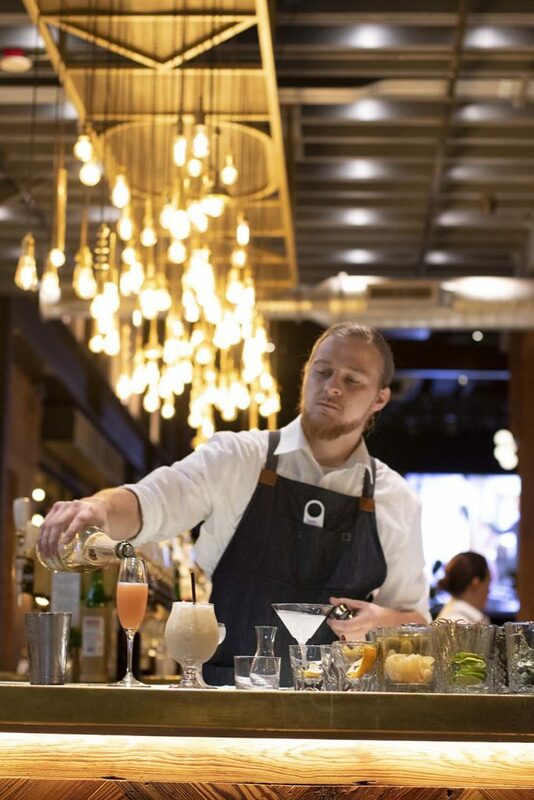 The Tavern offers up a bevy of craft cocktails. 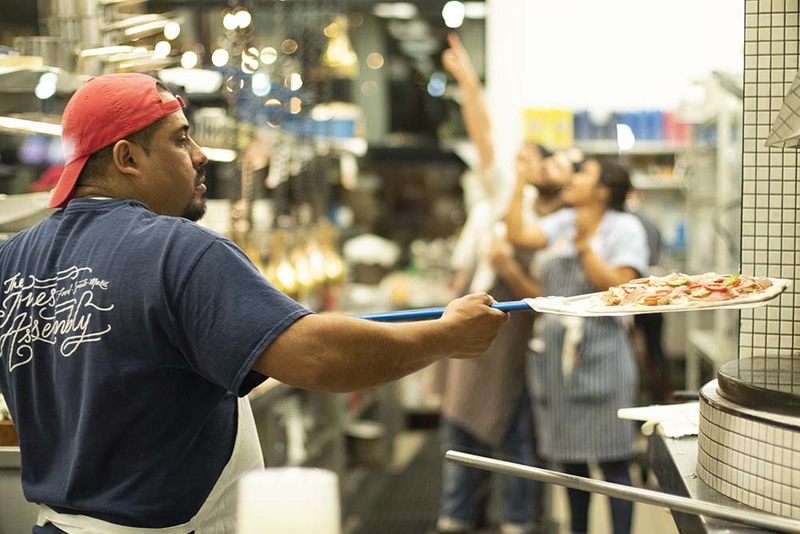 Behind the scenes in the kitchen. 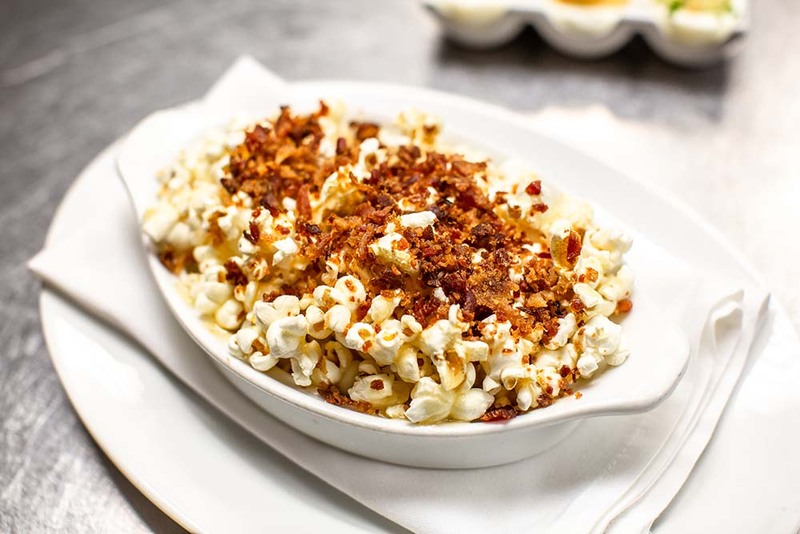 The Tavern’s Bacon Popcorn dish with maple butter and bacon pieces is a simple but delicious appetizer. 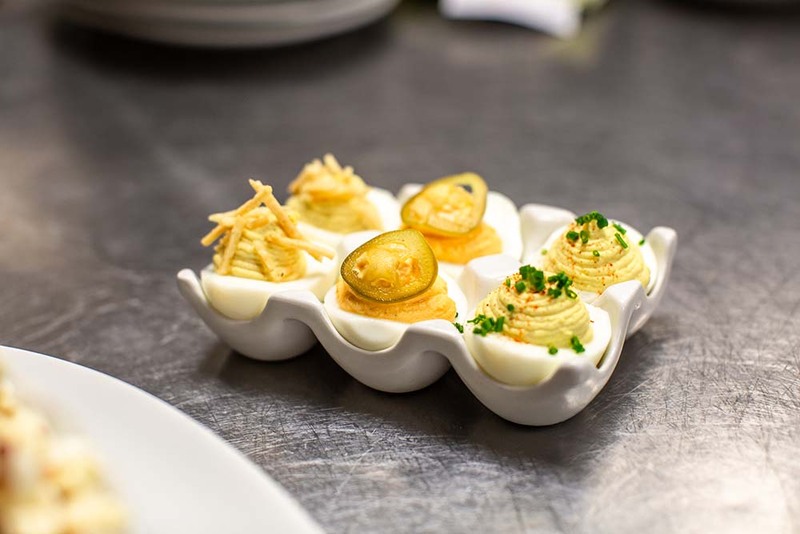 The Tavern’s Deviled Egg Trifecta includes two each of Sriracha, Classic and Ranch flavors. 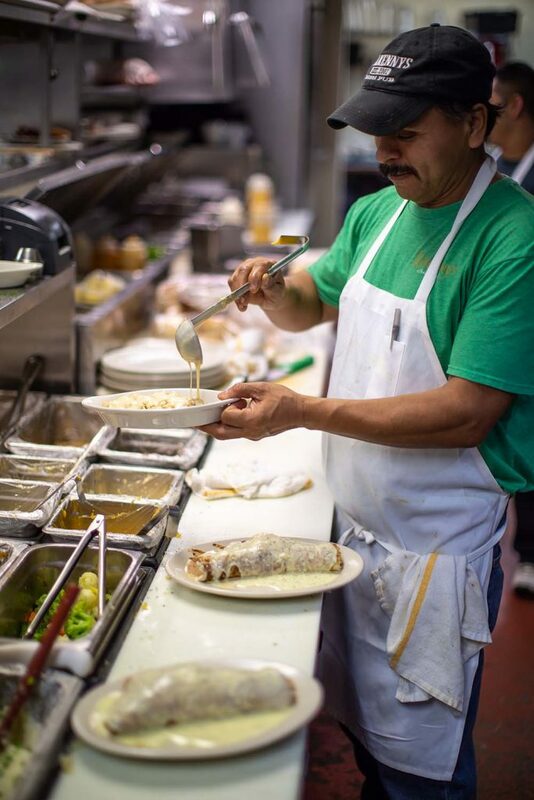 The kitchen staff at the Tavern pumps out delicious meals until 11 p.m. weekdays and 1 a.m. weekends. 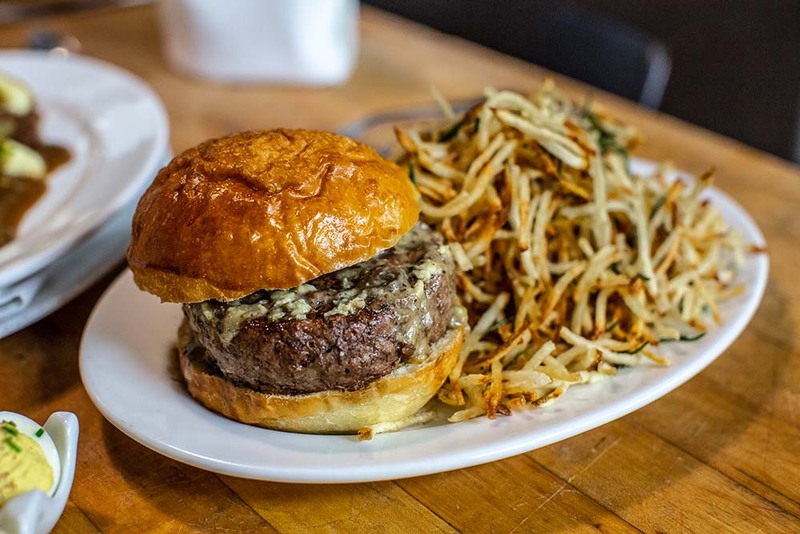 The Tavern’s beloved Tavern Burger. 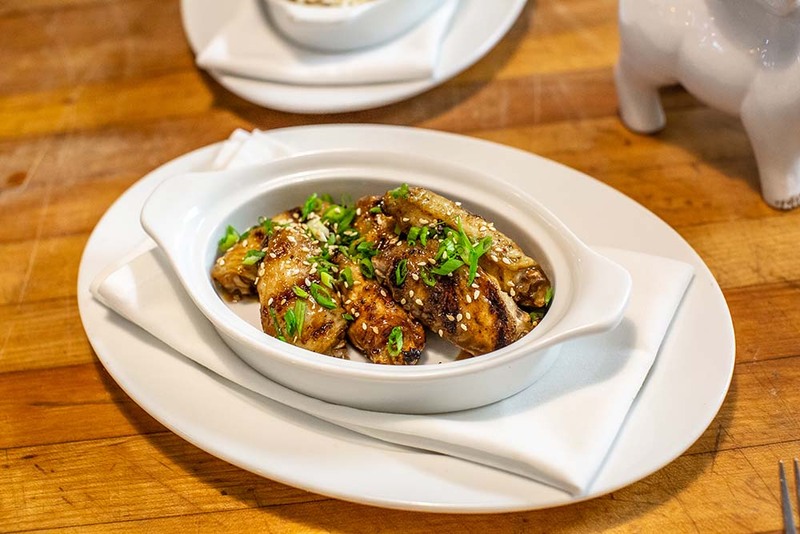 Enjoy the chef’s selection of chicken wings at the Tavern for only $8. 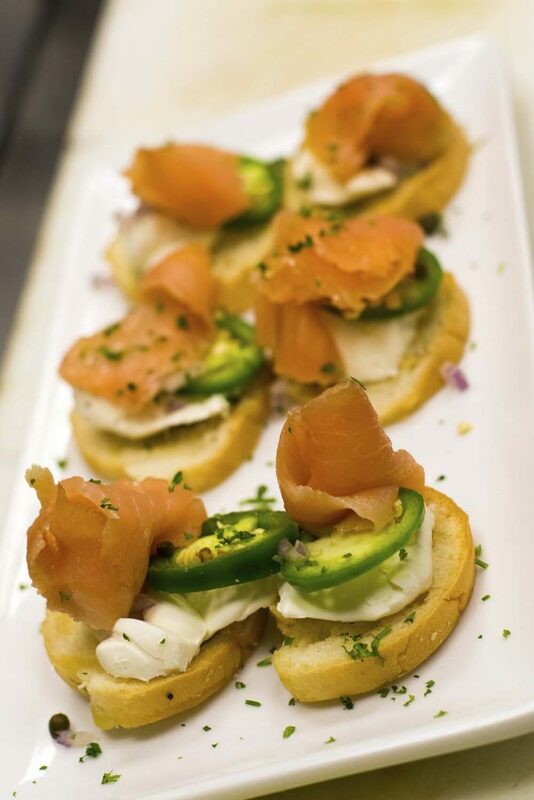 Appetizers galore! Try the duck fat fries, lamb sausage, or pork rinds with french onion dip at Fassler Hall. Photos by Josh New. 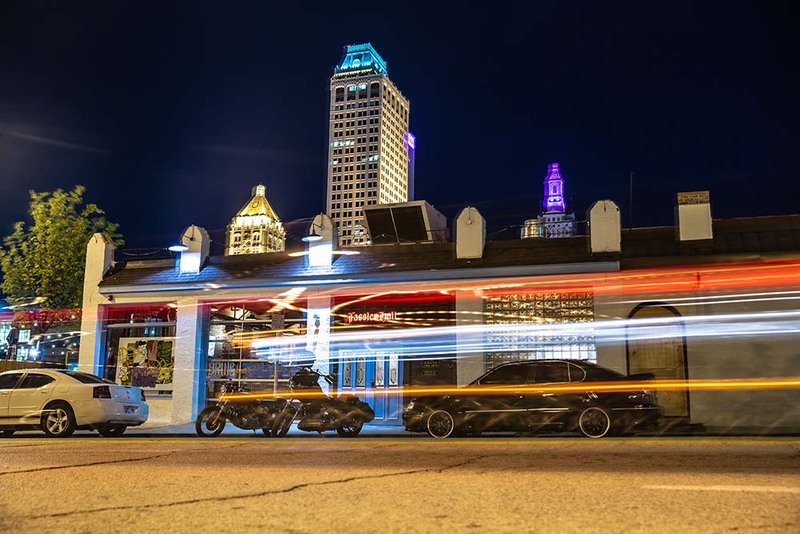 This bar-restaurant combo is a staple in the Tulsa late-night scene – you haven’t done this city right without a trip to Fassler. 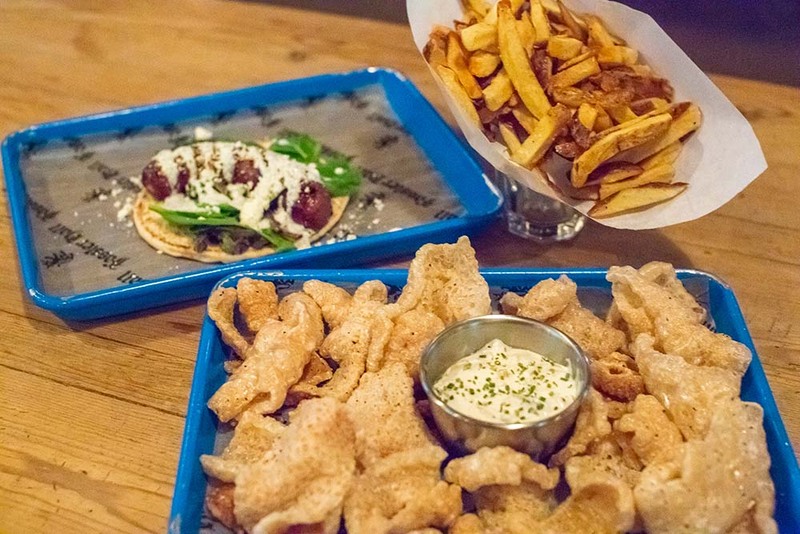 Munch on the sausage sampler, black pepper pork rinds or duck fat fries. 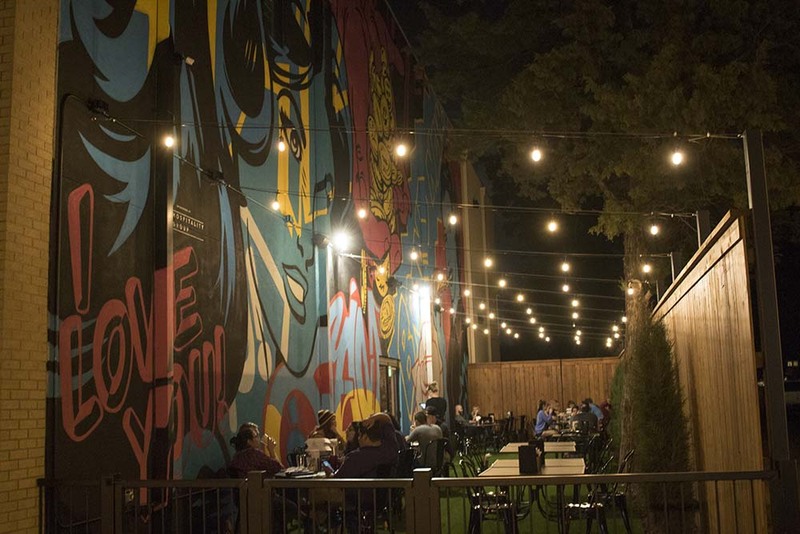 The roomy patio is where the action is: fresh-faced collegians alongside adults of all ages. 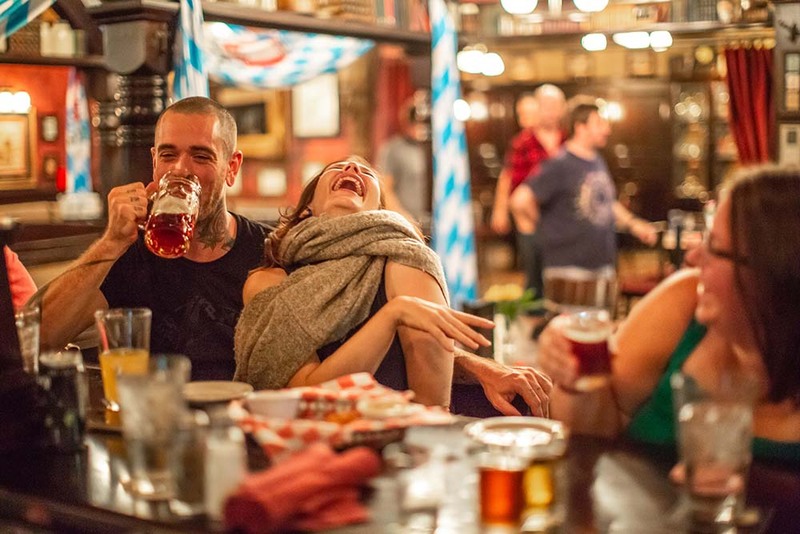 Half-priced sausages are served every Monday, and “we also offer pretzel bread pudding for dessert that pairs perfectly with a beer,” says Joy Toburen, marketing strategy manager at the McNellie’s Group. Bonus: There’s an OKC location. 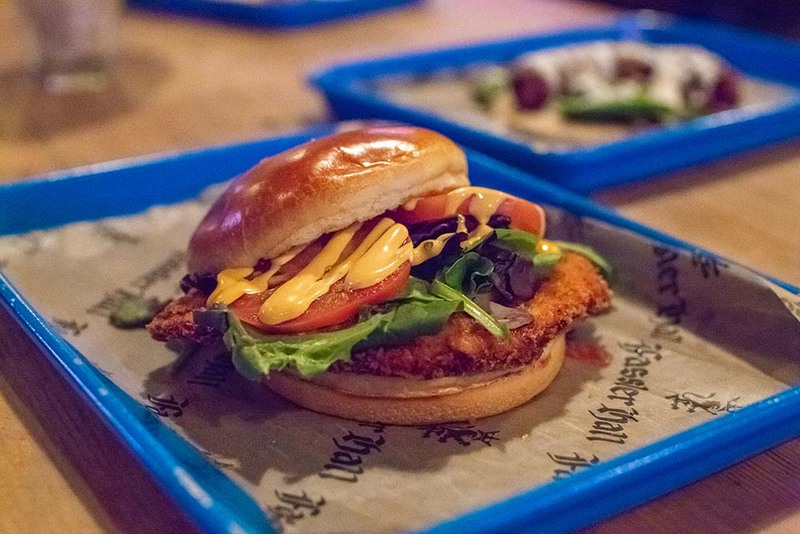 Fassler Hall in downtown Tulsa is open nightly until 2 a.m.
Fassler Hall’s chicken schnitzel comes with lettuce, tomato, smoked gouda and spicy mayo. 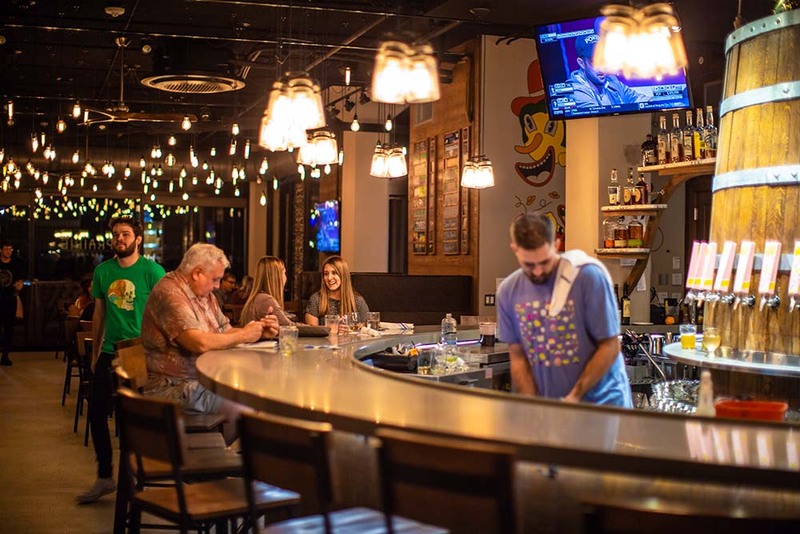 If you want something classy in Downtown OKC, The Manhattan offers generous happy hour specials from 4 p.m. to midnight daily, except Sunday, including deviled eggs (add shrimp or crab – swoon), oysters on the half shell and jalapeno onion dip. 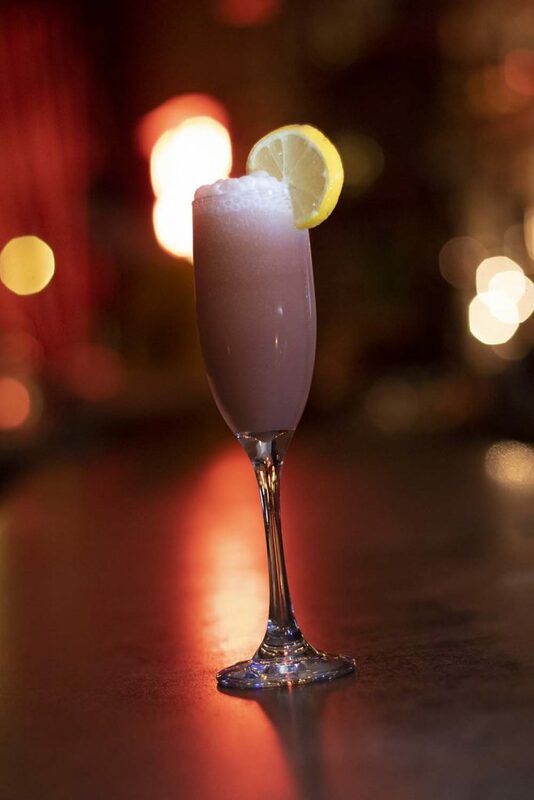 Wash it down with a drink from a robust cocktail menu, composed mostly of – you guessed it – Manhattans. 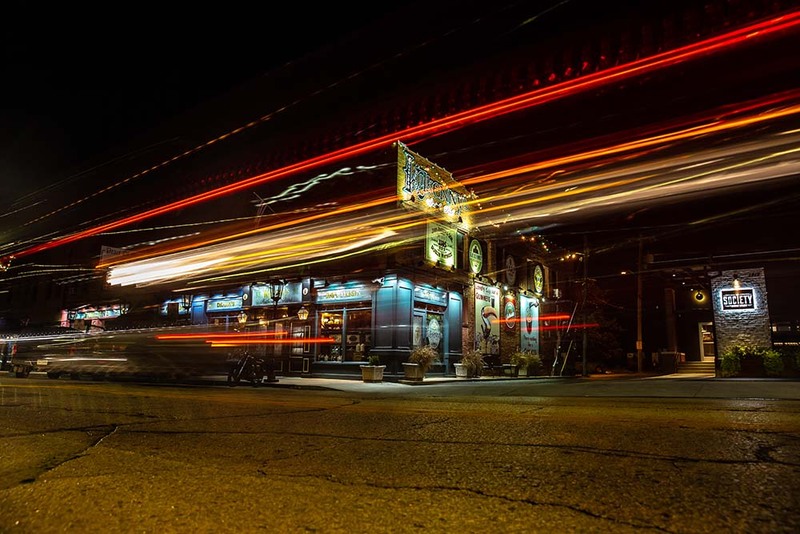 Postcript: The place is known to keep its doors open later than midnight on the weekends, depending on the crowd. 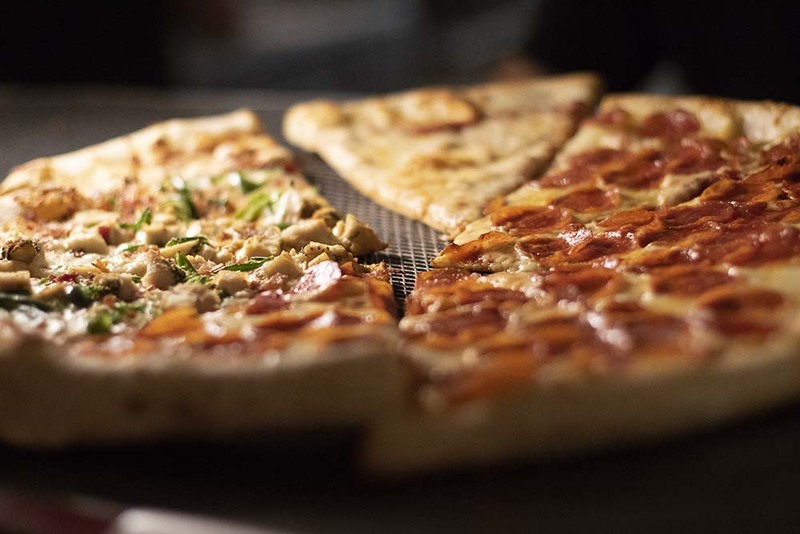 Pizza is the name of the game at Empire Slice House in OKC. Photos by Brent Fuchs. The joint’s motto says it all: “It’s like Frank Sinatra and David Bowie had a pizza baby.” A linchpin of the utterly transformed Plaza District, Empire Slice serves everything you need for an after-hours snack. 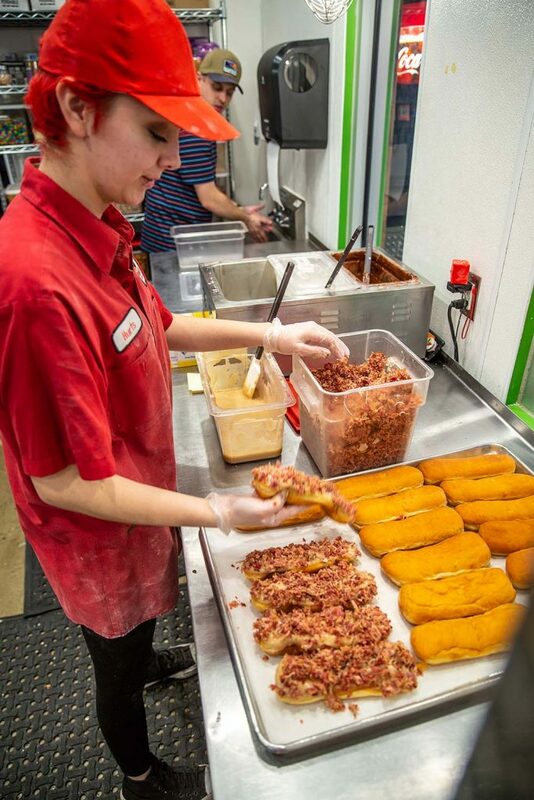 Late-night favorites include the Ghostface Killah, a spicy slice finished by crushed barbecue potato chips, and the Foghorn Leghorn, with sweet marinara, chicken, bacon, jalapeno and Sriracha sauce. Rachel Cope, CEO of 84 Hospitality Group, says every night at Empire is an adventure – from dance-offs to stolen (and returned) mascots. 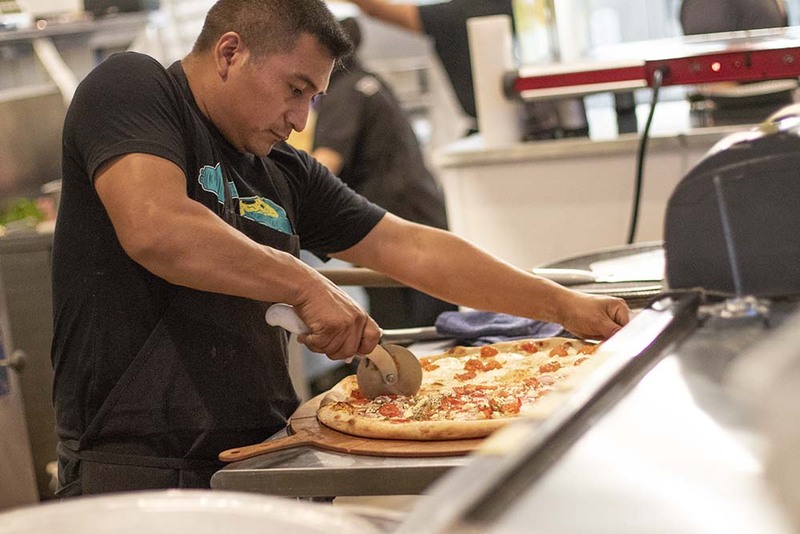 Pizza is the name of the game at Empire Slice House in OKC. 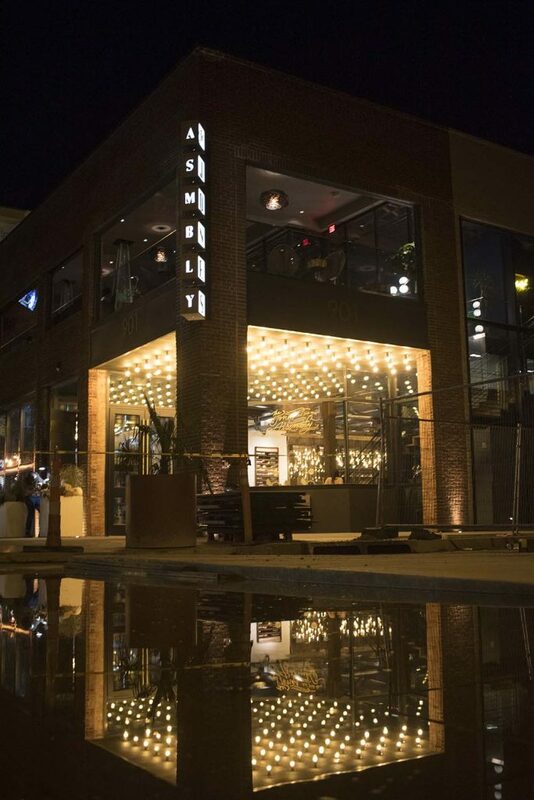 Empire Slice House offers up trendy, modern digs to enjoy while eating. 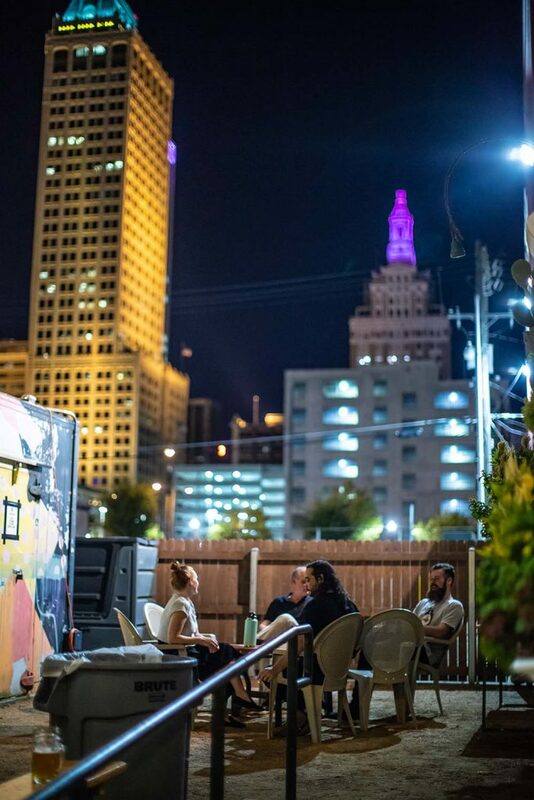 The well-lit patio at Empire Slice House is a hot spot in OKC. Authentic Mexican cuisine. Photos by Josh New. 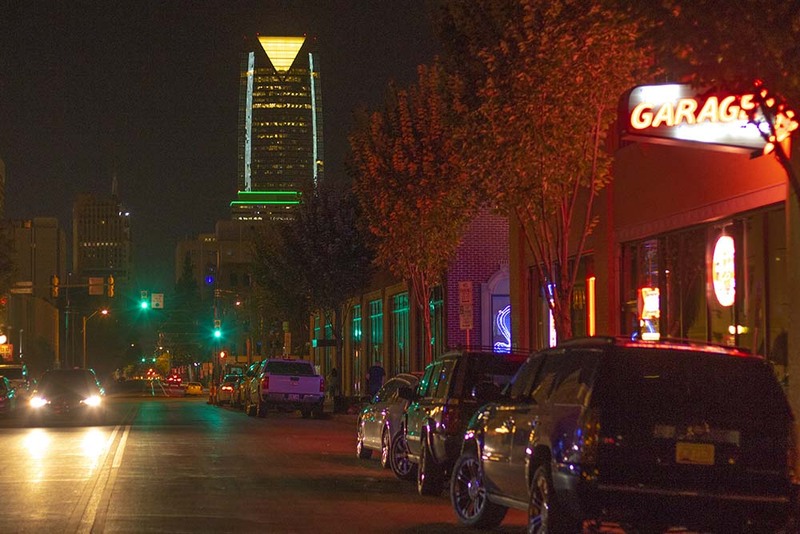 When you think of late-night dining in Tulsa, you (should) think Tacos Don. 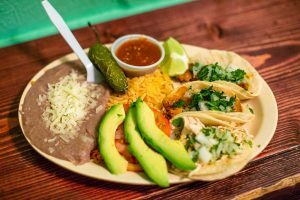 This no-frills, slightly austere joint makes up for its lack of space with flavorful and authentic Mexican dishes at affordable prices. 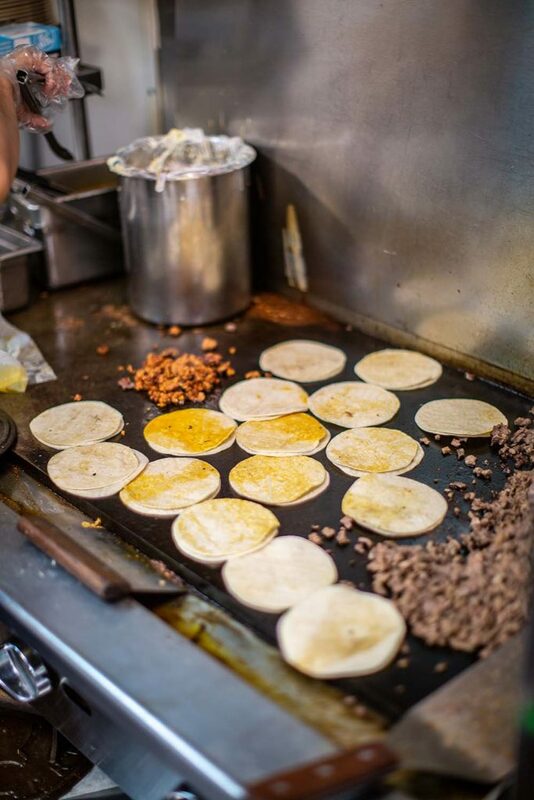 (Several platters, which come with rice and beans, are under $9.) The proof’s in the pudding … er, uh … guacamole. There’s often a line to the door, no matter the time. 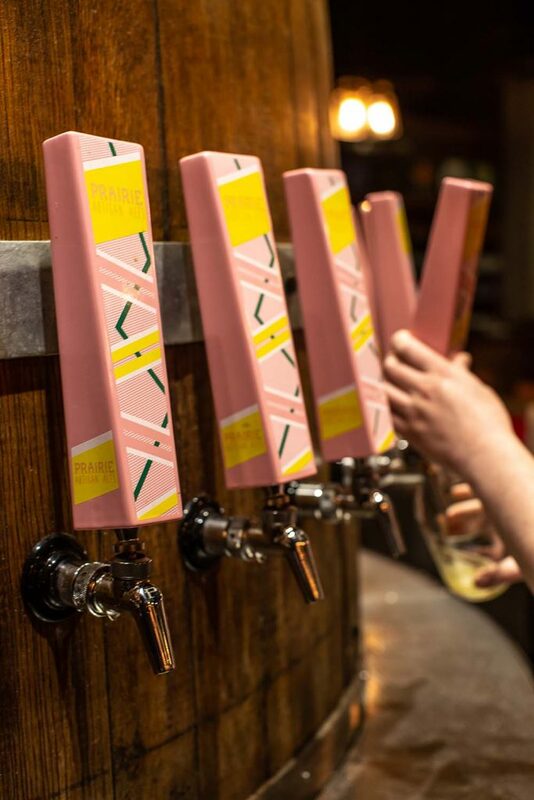 You can even find a few beers if you want to keep the party going. 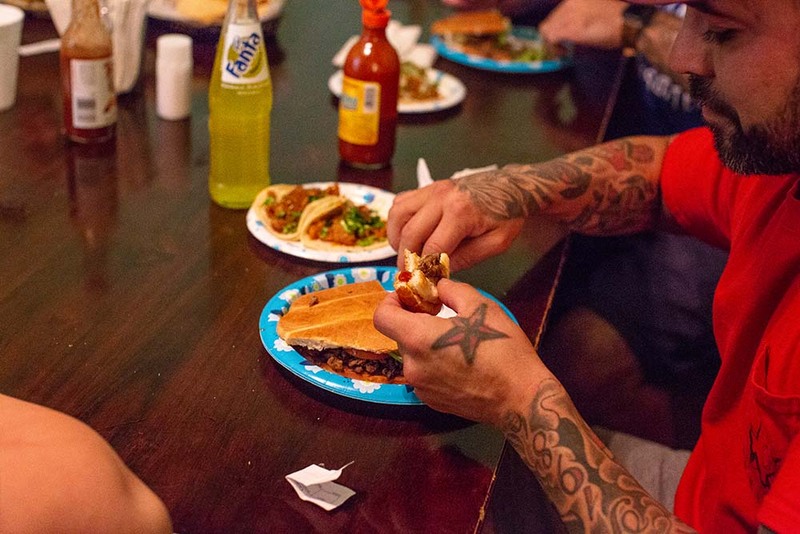 There’s often a line at the door at Tacos Don Francisco in Tulsa. 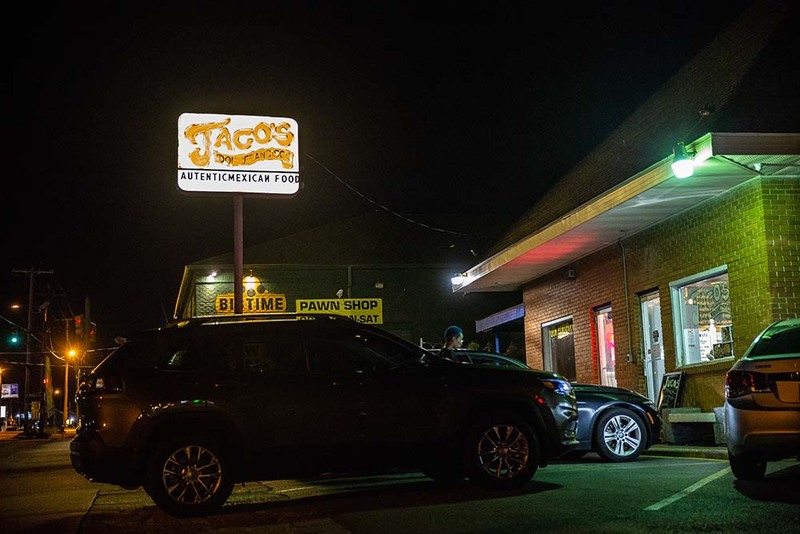 The billboard says it all: Tacos Don Francisco creates authentic Mexican food in Tulsa. 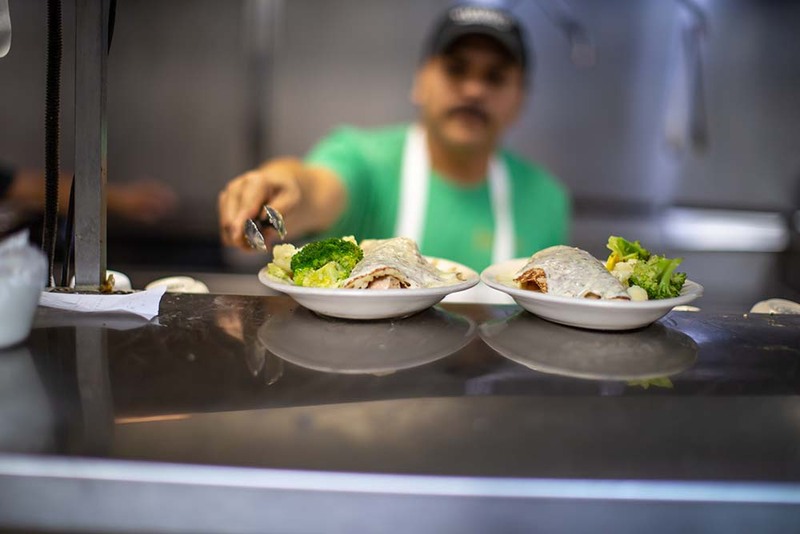 Authentic Mexican cuisine is the name of the game at Tacos Don Francisco, open until 4 a.m. on Friday and Saturday. The Jones Assembly’s Nashville Hot Chicken comes with scratch biscuits, hot honey and ranch slaw. Photos by Brent Fuchs. Full menu until 10 p.m. nightly, 11 p.m. during Thunder games. This recent addition to the OKC music-and-dining scene serves up delicious American fare in trendy digs. 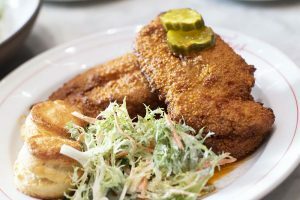 In addition to viewing national musical acts, grab some inspired mouthfuls of Nashville hot chicken, cornmeal-battered okra or scratch biscuits with honey butter. 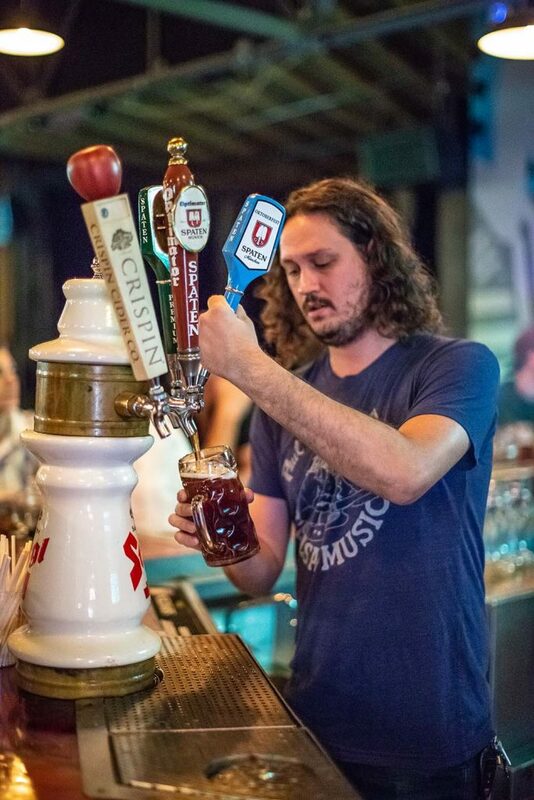 Be warned: The dining room is closed on show days, but that doesn’t mean you can’t jam out with Dawes (Nov. 6), Greensky Bluegrass (Nov. 14) or Kurt Vile (Dec. 5). 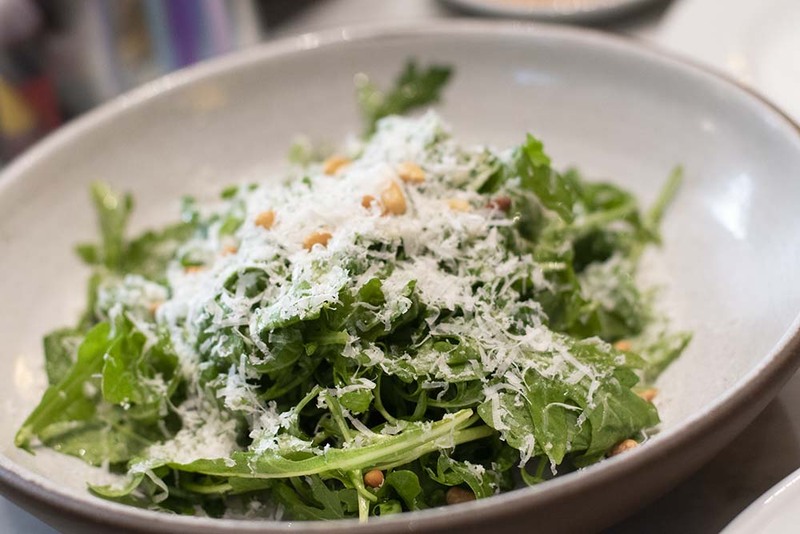 On the lighter side, The Jones Assembly’s Caesar offers up a bevy of local greens. 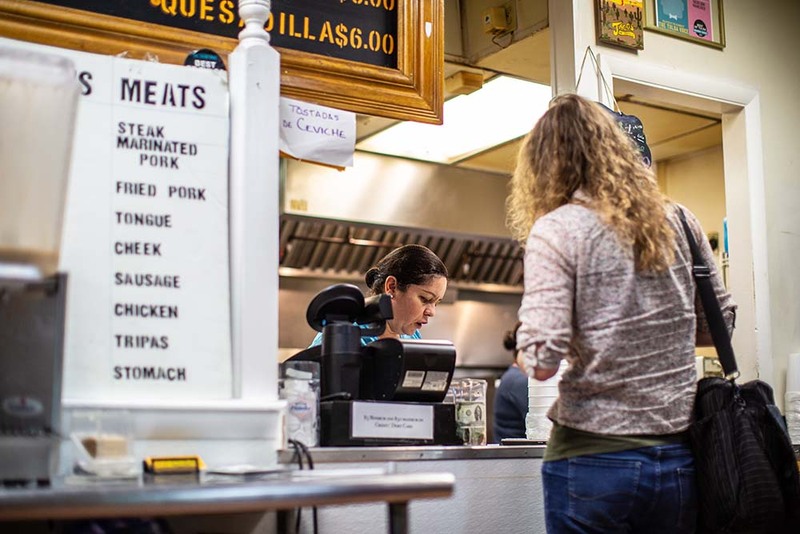 The Jones Assembly offers up late night bites until 2 a.m. on the weekends. 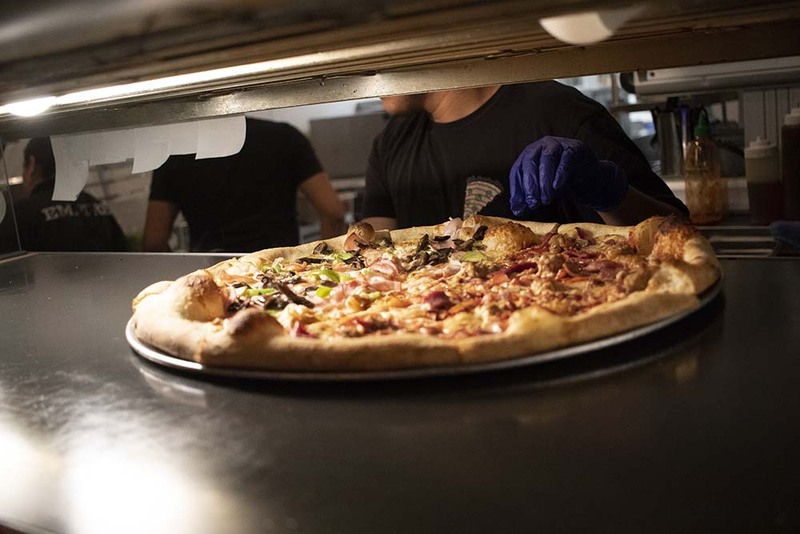 Among The Jones Assembly’s many American bites, pizza is a favorite. Enjoy an Oklahoma Wagyu Tenderloin at Ludivine in OKC. Photos by Bent Fuchs. 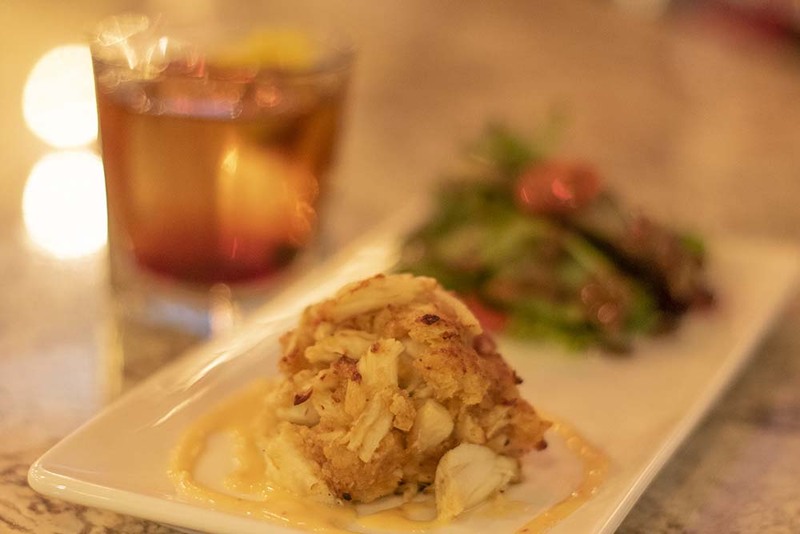 Full menu until 10 p.m.
Storied eatery Ludivine is the perfect place to grab a drink and a bite after a show. If you need a hit of protein, order the charcuterie. 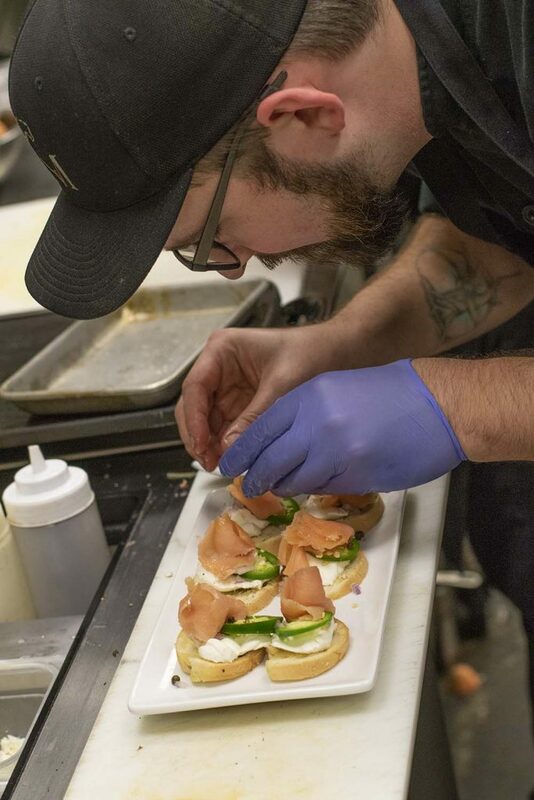 Selections rotate, but choices often include house-cured salmon, foie gras and a variety of cheeses and condiments. 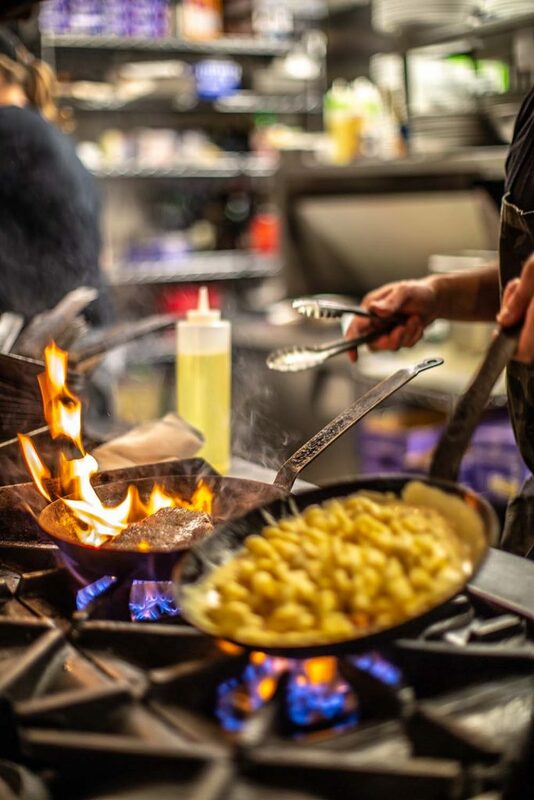 If you want to indulge, try the Oklahoma wagyu bavette steak. 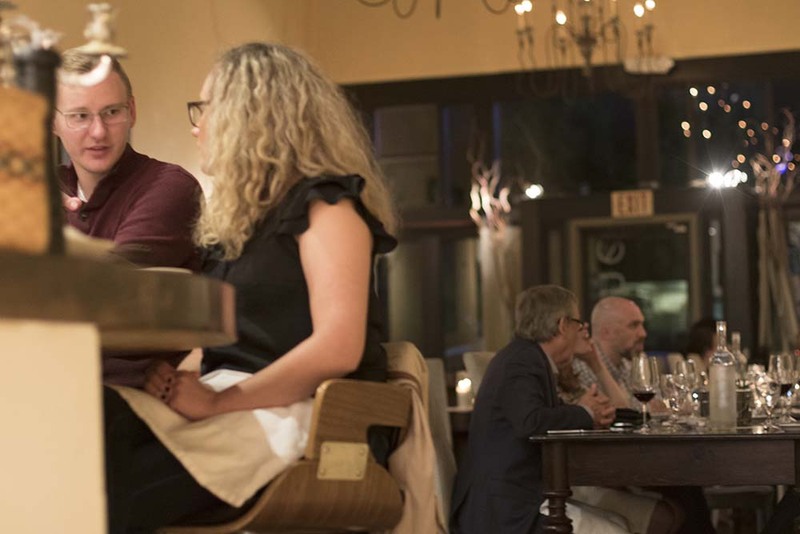 Ludivine diners in OKC enjoy meals like house-cured salmon, Wagyu steak and foie gras. 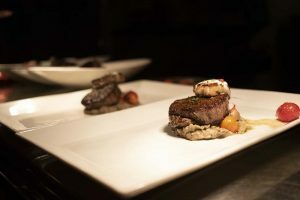 Enjoy an Oklahoma Wagyu Tenderloin at Ludivine in OKC. 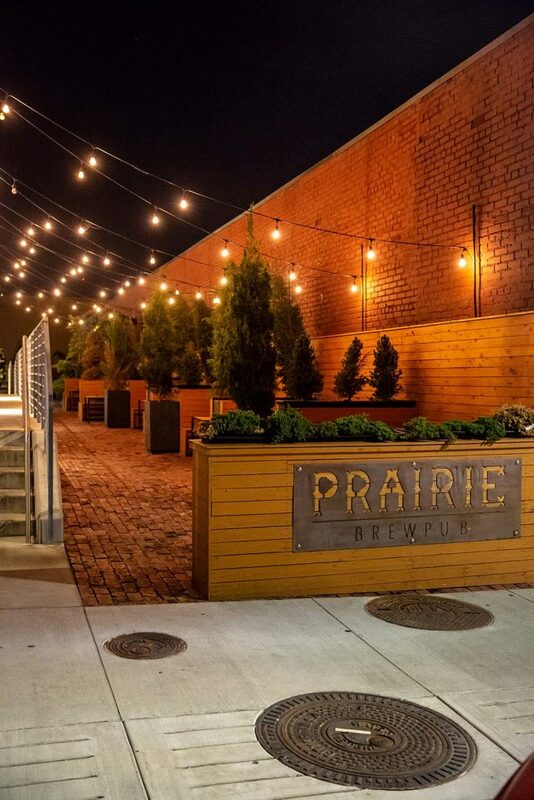 Sleek, modern and enticing, Prairie Brewpub is the perfect place to crash after a Brady Theater, Cain’s Ballroom or Vanguard show – for both the great food and the proximity to late-night entertainment. 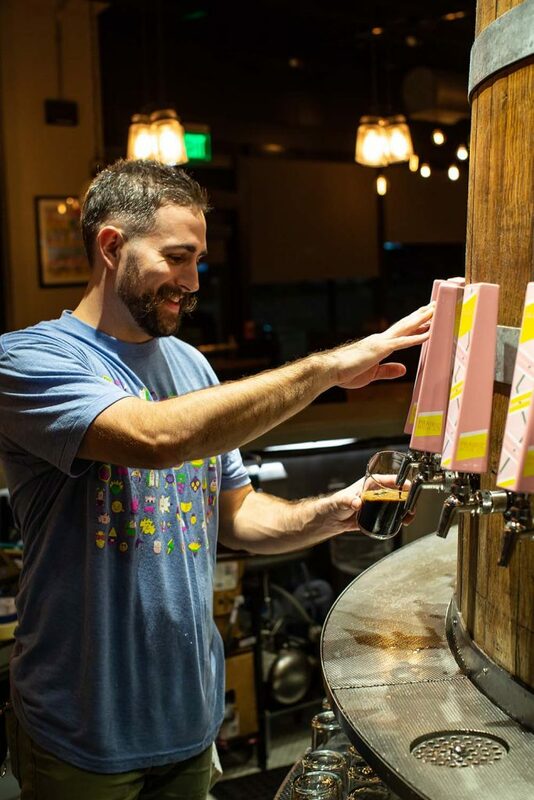 With plenty of local brews created in-house – including the restaurant’s namesake, Prairie Artisan Ales – and delicious American classics like braised short rib and pork tenderloin, you can’t go wrong. Make sure to venture to the unique outdoor booths, complete with fairy lights, to end your evening. 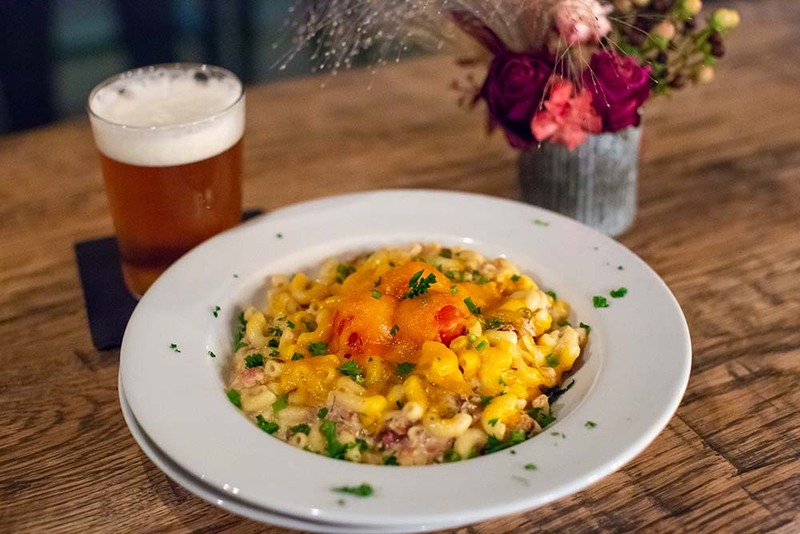 Prairie Brewpub’s signature Mac and Chase includes short rib braised in the restaurant’s own beer, Prairie Bomb!, plus bacon, roasted cherry tomato, green onion, macaroni and signature seven cheese sauce. Prairie Brewpub offers a rustic-chic atmosphere with casual dining and friendly service. The unique Hurts Donut Company donut flavors look like pieces of art, not desserts. Photos by Josh New. 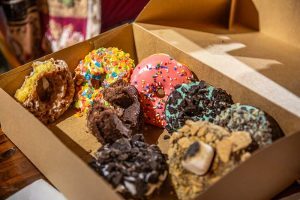 Hurts is not so much a doughnut shop as it is a sugary wonderland. 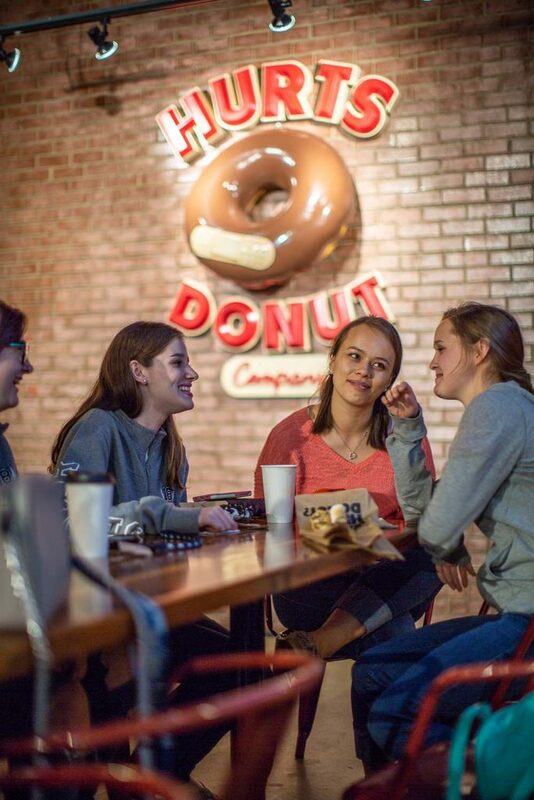 From the whimsical decor to the enthusiastic employees, your entire experience feels like a sugar rush … even at 3 a.m. You can often see bleary-eyed students or workers shuffling in to get an energy boost, or post-sporting event crowds hankering for dessert. 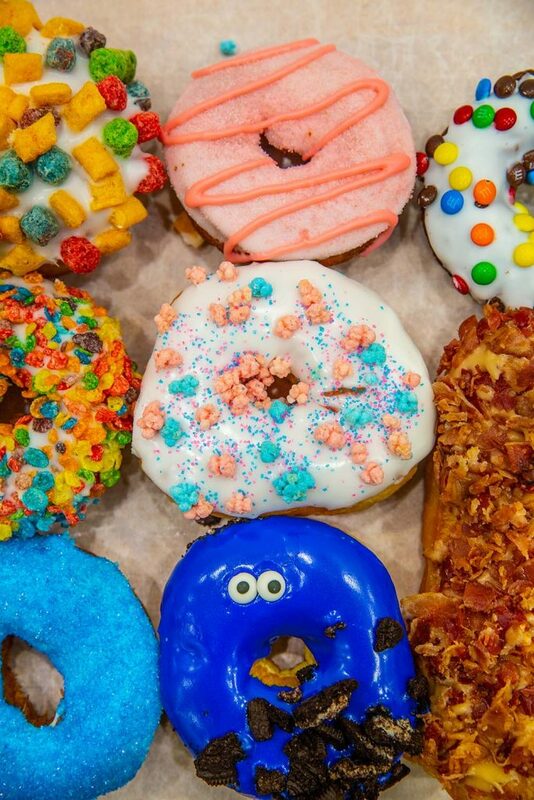 From the Cosmic Brownie to the Fruity Pebbles, these delicacies are too pretty to eat … almost. You can find the chain in Norman and OKC, too. Chicken and waffles is a signature dish at Beverley’s Pancake House. Photos by Brent Fuchs. It’s not your post-party imagination: The mural in Beverly’s bears a golf-club wielding chicken insisting, “I’ll gladly be fried for Chicken in the Rough!” Once a successful international chain, this is the last Beverly’s location in the state. 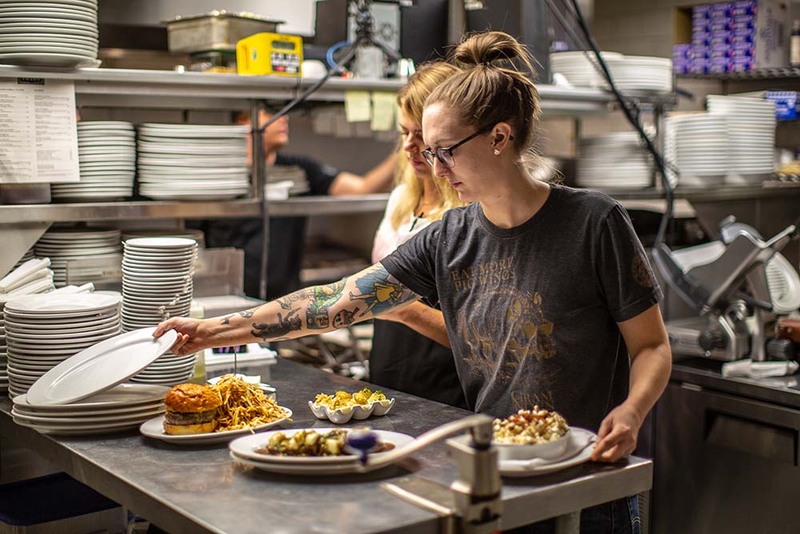 There’s a lot to choose from, but you can’t go wrong with the signature dish – pancakes – or try pretty much the best fried chicken in OKC. 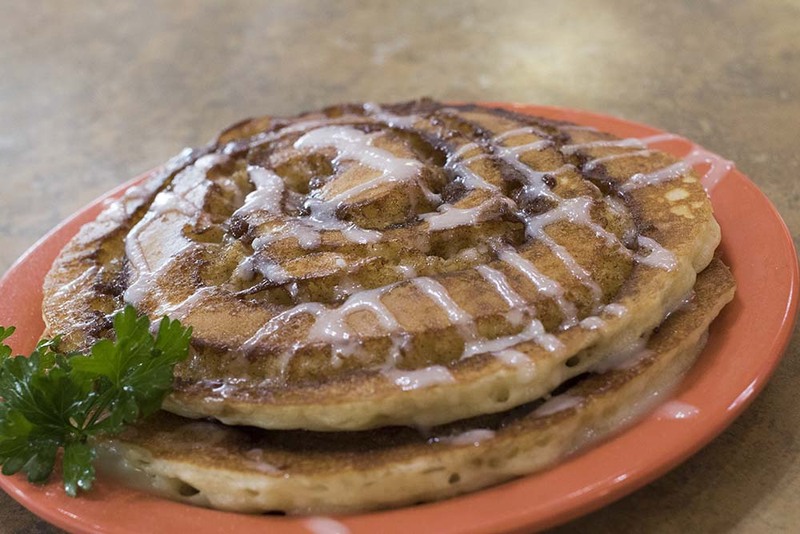 Cinnamon roll pancakes, anyone? 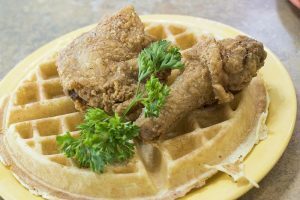 Visit Beverley’s Pancake House in OKC to try. 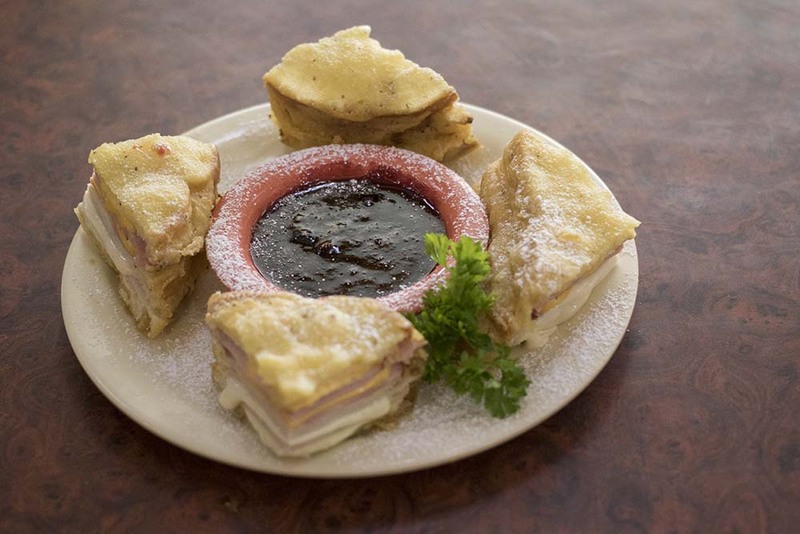 The Monte Cristo sandwich at Beverly’s Pancake House is a triple decker sandwich with ham and turkey, plus Swiss and American cheese, dipped in batter, served with a raspberry sauce. For the night owls, Beverly’s Pancake House is open 24 hours a day. Kilkenny’s Butter Slip Burger boasts a half pound of fresh ground beef on a Kaiser roll with lettuce, tomato and onion. Photos by Josh New. 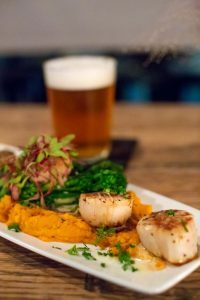 Known for its Irish cuisine, Kilkenny’s boasts dishes you can’t find many places in Tulsa: cottage pie, bangers and mash, classic corned beef and boxties. There are also twists on classics; the Irish sirloin, for example, is topped with Irish whiskey and mushroom sauce. 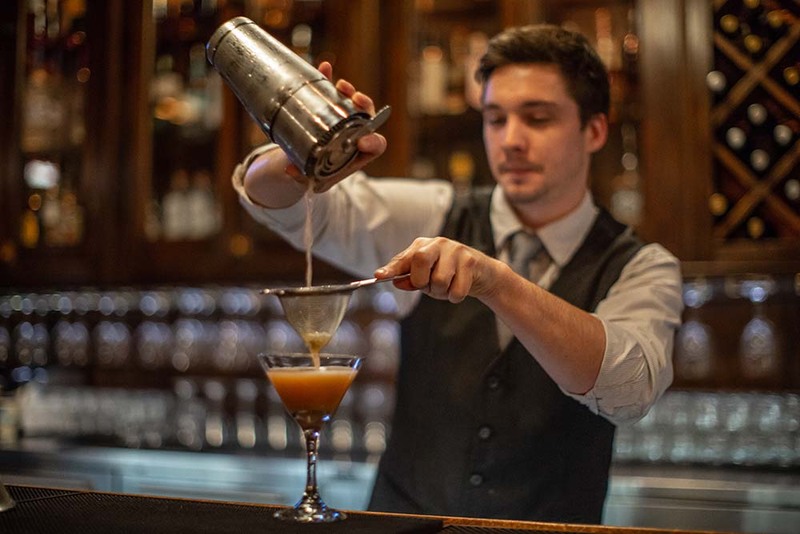 If you’re looking for a new watering hole, Kilkenny’s full bar boasts premium spirits: whiskey, wine, brandy, beer and pretty much anything else you can dream up. 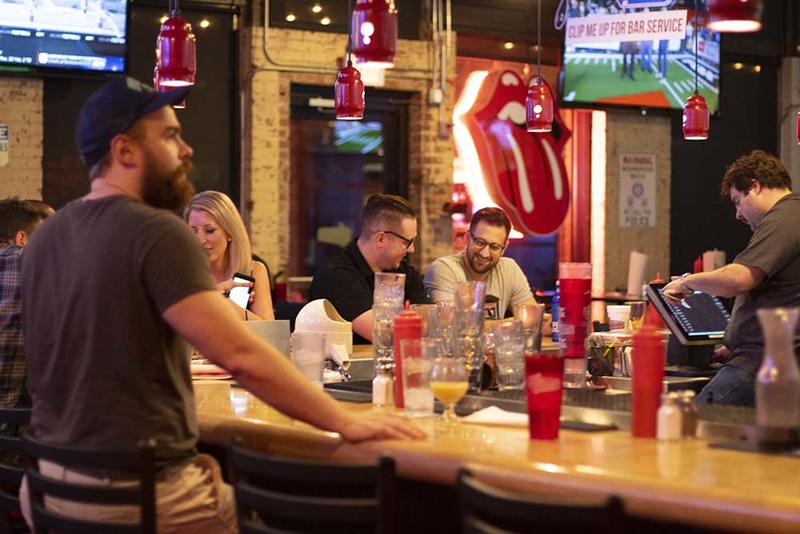 Late-night diners are rewarded with food specials after 10 p.m.
Kilkenny’s can be found on the bustling Cherry Street in Tulsa. 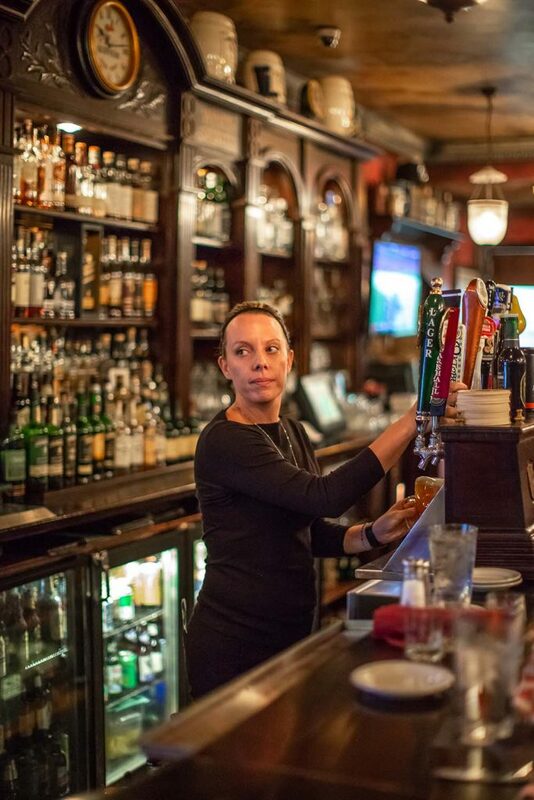 Late night diners are rewarded at Kilkenny’s, with food specials after 10 p.m. each night. 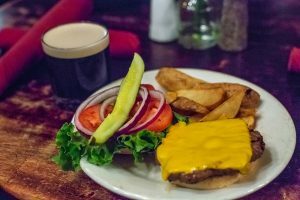 Kilkenny’s Butter Slip Burger boasts a half pound of fresh ground beef on a Kaiser roll with lettuce, tomato and onion. 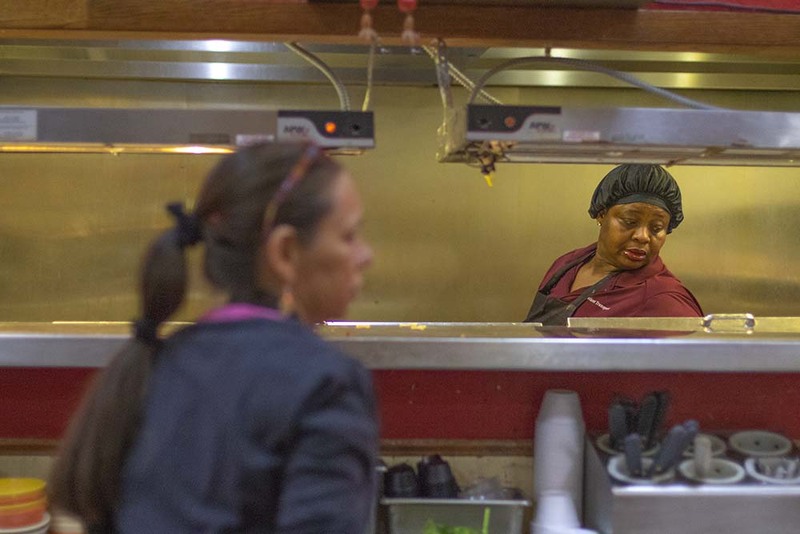 The kitchen staff at Kilkenny’s works late into the night – diners can order off the menu until 12:45 a.m. 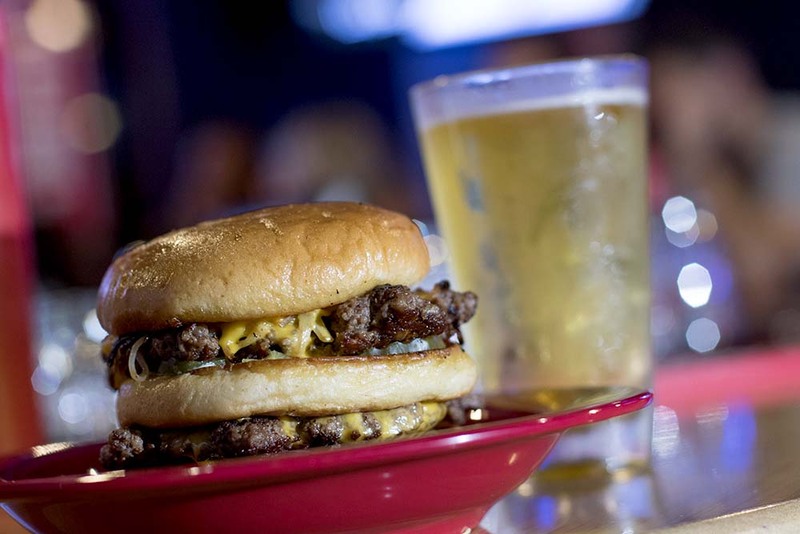 The Garage Burgers and Beer in OKC offers up ‘The Big G,’ with two patties – one cooked fried onion style – pickles, onion, American cheese, ketchup and mayo. Photos by Brent Fuchs. 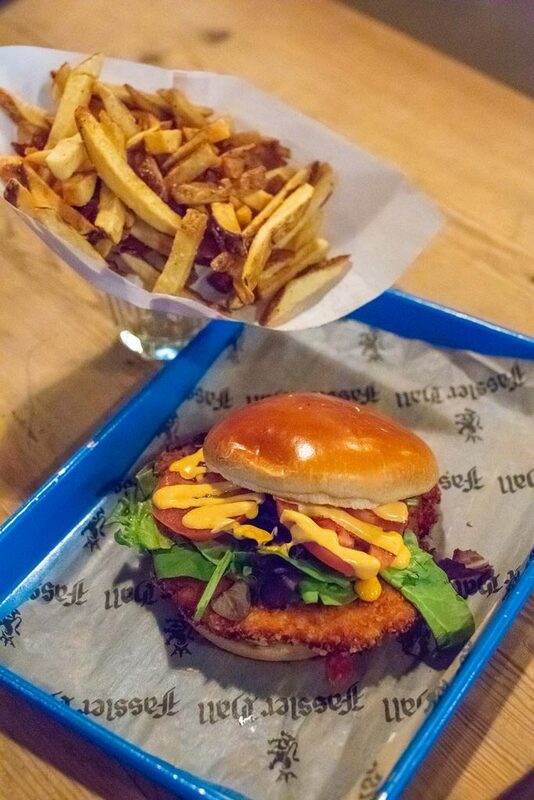 While burgers and beer may be the stars of the show at The Garage, there’s a lot more to tempt a late-night appetite. From 10 p.m. to midnight, snag the Classic Burger for $3.99 and appetizers for half price (plus drink specials). 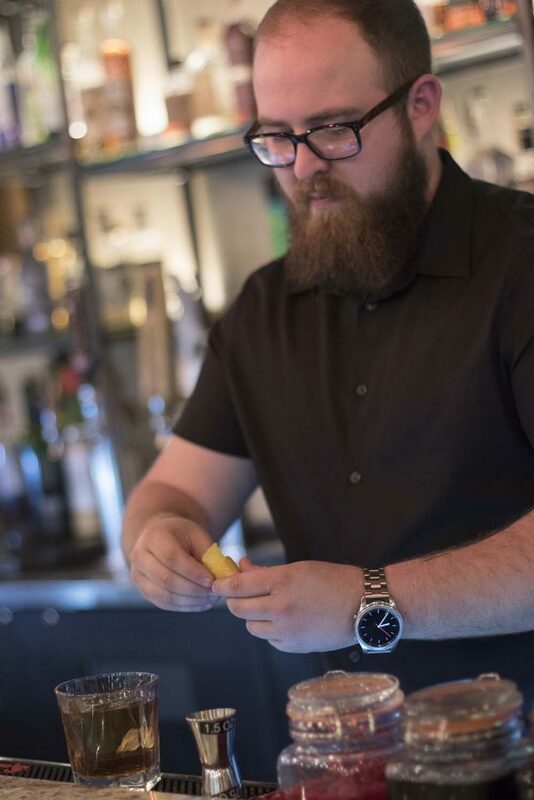 Managing partner Brandon Kistler says don’t miss out on the creamy onion dip – a confection of sour cream, cream cheese and caramelized onions served with house-made potato chips. 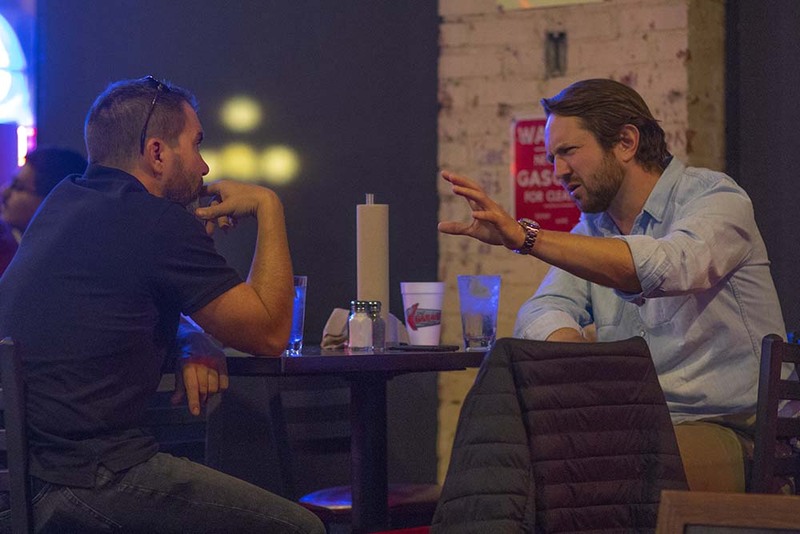 There is a bevy of locations in the state’s two main metro areas, but operating hours are a bit shorter in Tulsa County. ‘The Big G,’ with two patties – one cooked fried onion style – pickles, onion, American cheese, ketchup and mayo. 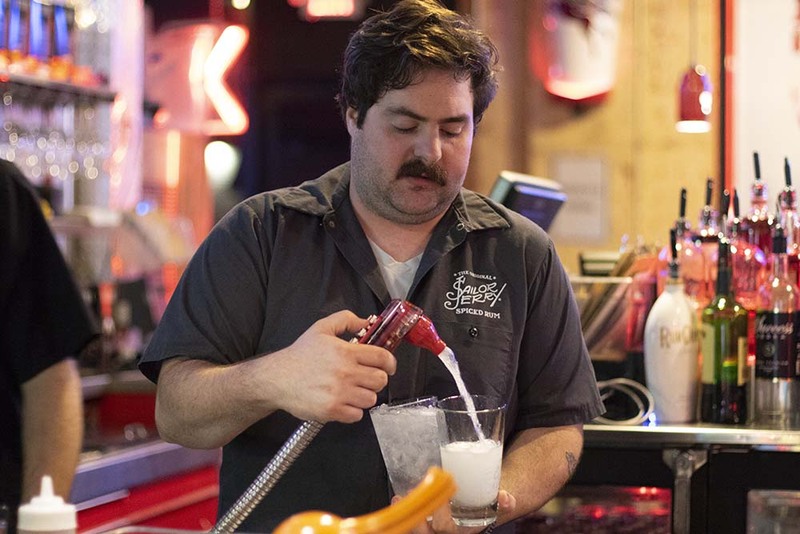 The Garage Burgers and Beer takes its dress code seriously. 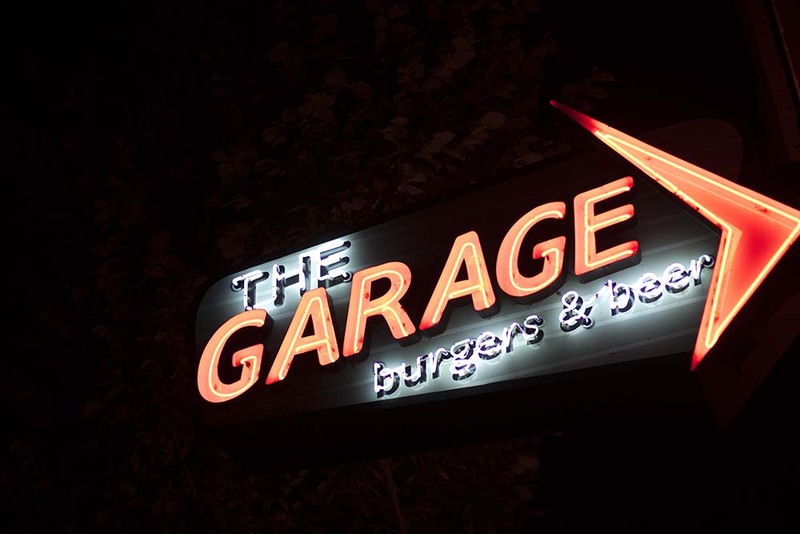 The Garage Burgers and Beer in OKC stays open until midnight during the week and 1 a.m. on the weekends. 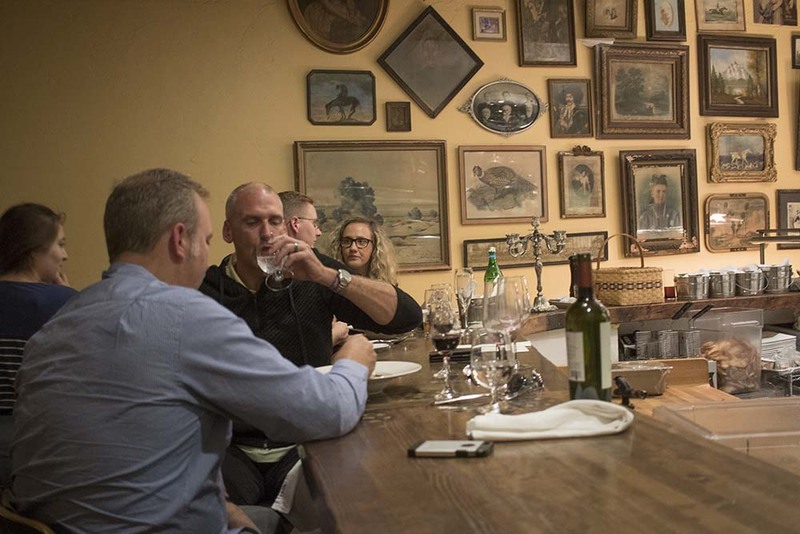 You get high-end dining in a dimly lit joint. The only downside is that it’s a bit of a hunt to find the entrance. 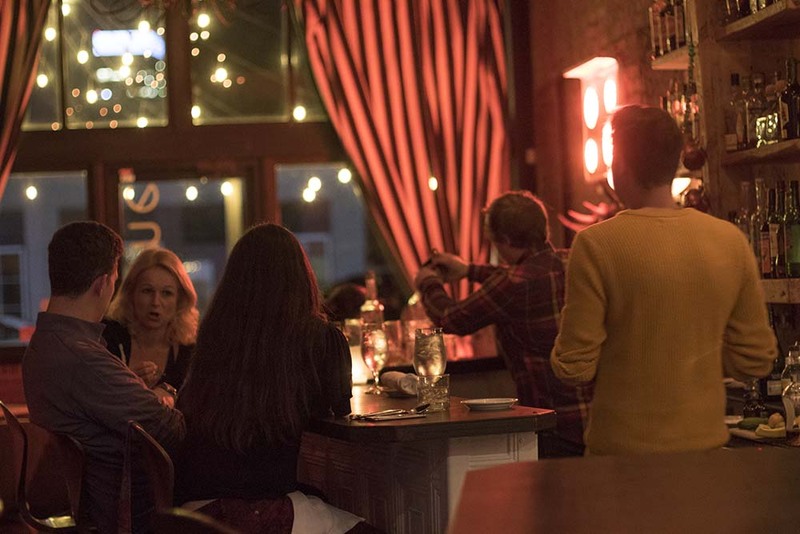 Find retro digs, diner food and great cocktails. 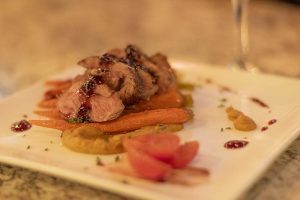 It offers American fare, simple and delicious. 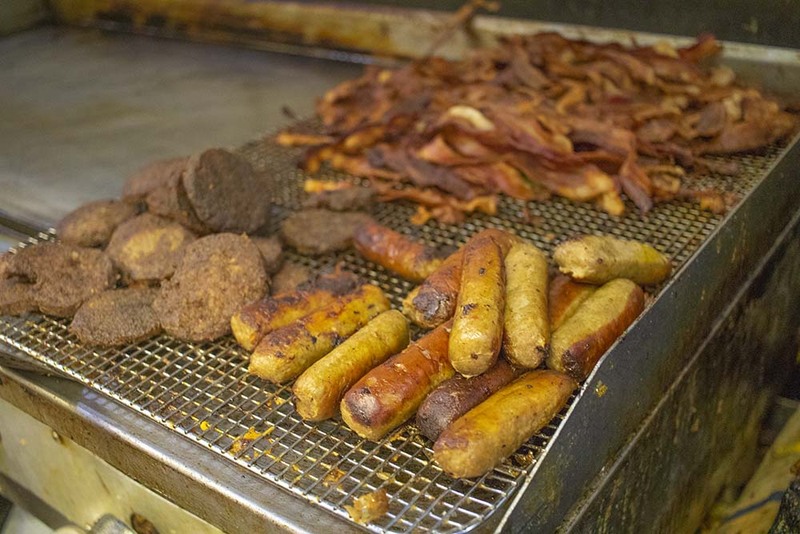 Here, no one judges you for eating a cheesesteak at 3 a.m. 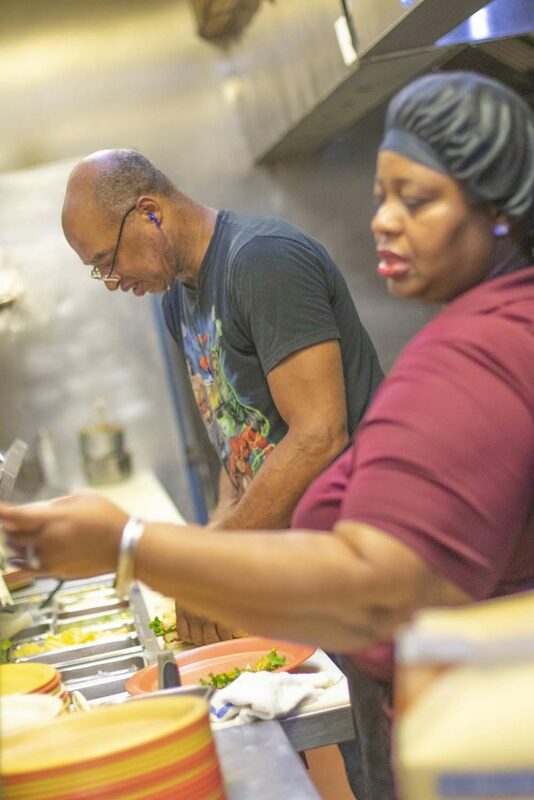 Try a little bit of New Orleans in Oklahoma. 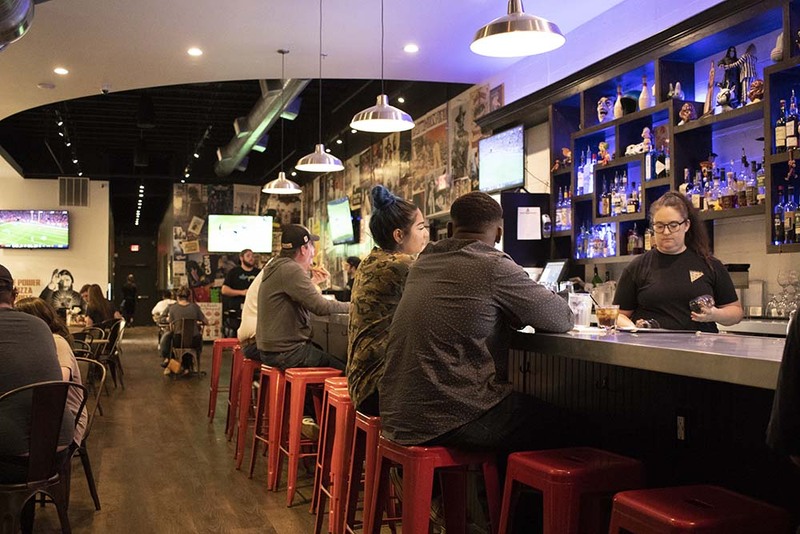 This gas station-turned-bar offers small plates and creative cocktails. 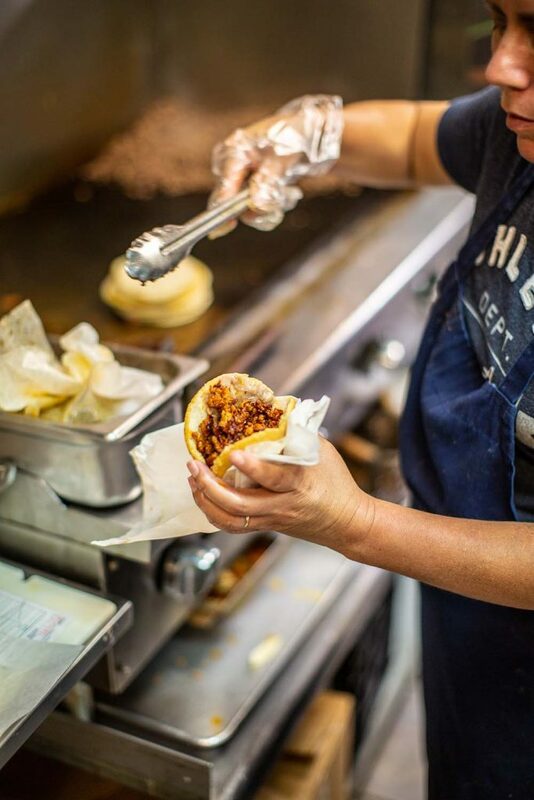 This food truck park offers a taste of different OKC eateries. 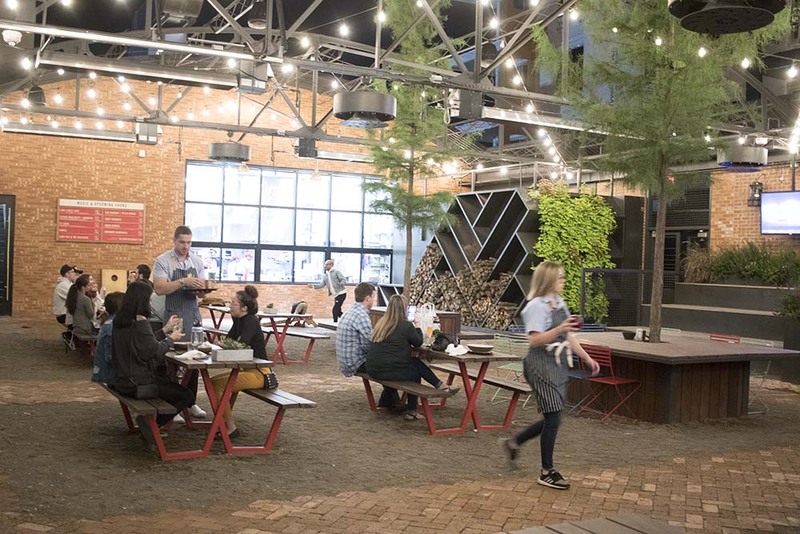 Try Japanese bites and lots of ramen while sitting on a killer patio. 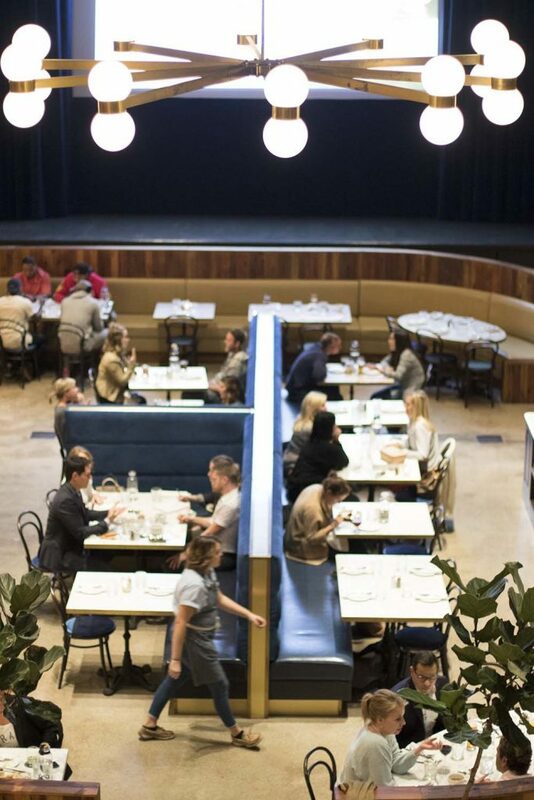 Modern and eclectic, Guyutes has American grub with plenty of vegan and vegetarian options.